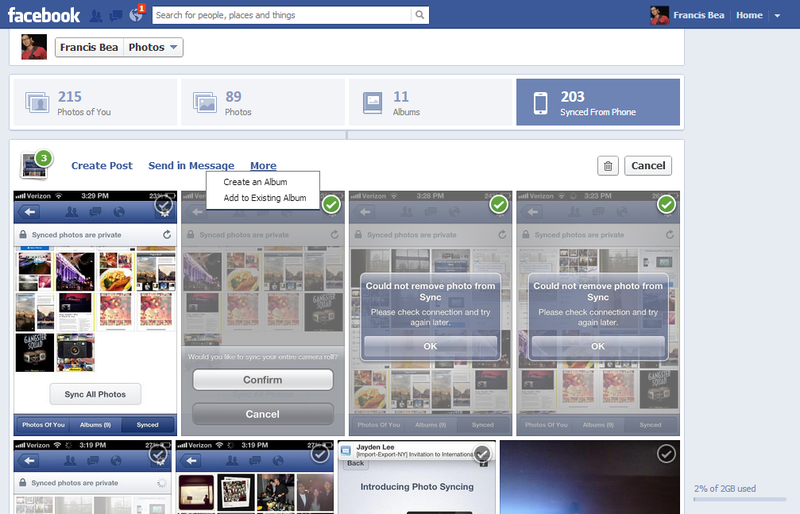 After months of testing, Facebook finally launched its photo syncing feature for both iOS and Android devices. The new product is a convenient option for users to store all of their images in what’s essentially free storage space of up to 2GB courtesy of Facebook and push them public when you so choose – of course there’s that pesky privacy thing, and users are right to maintain a little concern about something that directly sends data to the social network. Does Photo Sync’s benefits outweigh the risk of unwittingly uploading photos you’d rather keep to yourself? We go hands on with the new feature and break down the pros, the cons, and everything in-between. If you haven’t already enabled Photo Sync, you should see a notification that pops up on the News Feed of your iOS or Android device asking if you’d like to sync your phone to the desktop app. Don’t worry about any downloads from the App Store, no need to head there for Photo Sync. Facebook says that the feature was already a part of the build in a previous update, but it was simply just turned off. To turn it on, you’ll need to go to your Facebook profile page on the smartphone app, and select “Photos.” At the very bottom of the screen you’ll see a button for “Synced.” That tab will take you to a splash page briefly introducing you to Photo Sync. Opt into the feature by clicking on the “Sync Photos” button. Once this is done, if you open up the Facebook desktop app and go into your photos, you’ll see a new tab labeled “Sync for iPhone,” and here you’ll find the photos that have been synced. At first, not all of your photos will be immediately synced (keep in mind we’re testing this feature on an iPhone). Fewer than two dozen of your most recent images will be automatically synced, and to allow Facebook to sync the rest of your images you’ll need to scroll down and opt in again by pressing the “Sync all Photos” button. Syncing won’t immediately happen when first turn the function on. In this initial hands on, it probably took around 45 minutes to sync 300 photos. But once this is over, all photos taken are automatically uploaded from then on until you disable the feature. You also can’t actually share photos within the Synced page on the smartphone app. The page is just a repository for reviewing the photos that you’ve synced, although you can delete photos here if you wish. 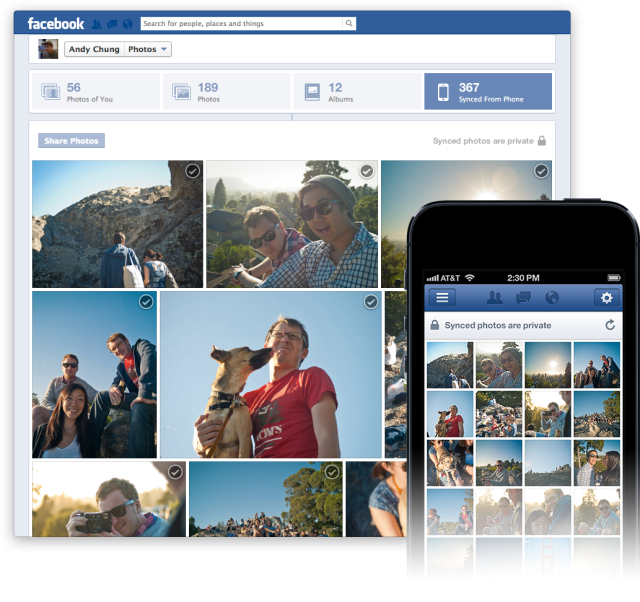 If you want to share these images directly from your smartphone, you’ll need to access Facebook’s in-app camera. This is where all the magic happens. As mentioned before, you can use Facebook’s native and now built in Camera app to share your photos, group them into albums, and even adding flair using Facebook’s photo filters, but there’s a certain comfort in managing photos from the desktop as well. It’s really not uncommon for your fingers to accidentally open up different types of links on your smartphone, which could mean the difference between sharing a photo of your dog or a photo of … something else that you don’t want your Facebook friends seeing. That’s probably the nicest way to phrase it. When you select one or more images on the “Synced from iPhone” tab – each photo you select is marked by a green checkmark – buttons will appear for creating a post with the photos that you’ve selected, sending the photos in a message, creating a new album with them, or to add selected images to an existing album. Deleting images can also be done here, which will become a familiar tool for those of you that are already reaching the 2GB limit. Since every action taken on the smartphone version of the app is synchronized with the desktop app, every photo that finished syncing from your phone will trigger a desktop notification, along with a number of photos pushed. What this also means is that if you’ve deleted a synced photo from your smartphone, that photo will be deleted from your iPhone gallery as well. Some other smaller features that you might overlook is that the photos are displayed by month, and the bottom right corner of the page shows the percentage of free space that you’ve used of the 2GB. Downloads of the images are also supported via the desktop version of Photo Sync. This feature is an important one to take note of. On the smartphone app, there’s a gear icon at the top right corner of the Synced page where you can select one of three options: “Sync over Wi-Fi or cellular,” “Sync over Wi-Fi only,” or “Don’t sync my photos.” You’ll want to specify which setting you want since by default you’re syncing over Wi-Fi or cellular. You can also keep track of how much storage you’re using up here. 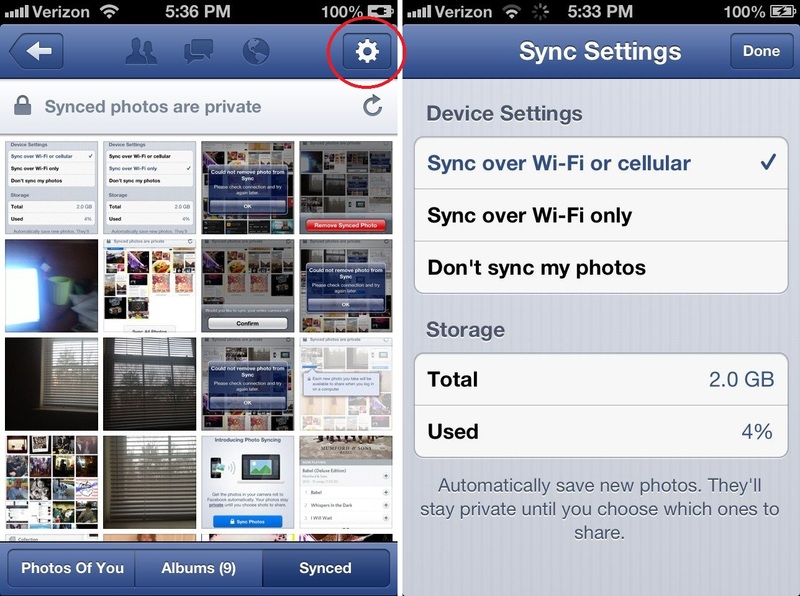 Sync Photos makes sharing seamless … Instagram integration on the way? After toying around with Photo Sync on Facebook, the initial impression is that it’s a bit slow and manually refreshing the iPhone and desktop versions to see the latest images gets old. We also encountered a bug that wouldn’t allow us to delete something; a prompt reading “Could not remove photo from Sync,” kept popping up on the iPhone – which could be a bit horrifying. However we saw that the photo was deleted when viewing via desktop. Overall, Sync Photos could easily be a Facebook Photo addicts dream come true. The sharing process is seamless and takes just three steps from selecting photos to publishing it on your Timeline. There’s also an opportunity here for Instagram integration as well, given how Facebook is trying to tie these so tightly together – although, the privacy implication there is that the security and relative exclusivity of sharing photos via Instagram would come into question. We reached out to Facebook for comment on this and we’ll update if we hear a response. For now, go forth and use Photo Sync – as long as you’re comfortable with Facebook’s ability to keep those auto uploads private until you say otherwise.